One of the best ways to spruce up your backyard and add value to your home is with a custom built outdoor cooking area. You may think this is difficult, but the grill part is easy, it's the enclosure for it that's challenging. Most gas grills can be bought head only, meaning you don't get the cart, just the working parts of the grill. A charcoal grill may require nothing more than a couple of cooking grates that you can buy from most any grill parts store. The quickest way to put together a custom grill area is with a grill Island. These prefabricated units can be brought in and set up in an afternoon. However, they can be expensive and if you don't live near a manufacturer you might get a significant shipping bill. If you have basic DIY skills, you can get exactly what you want by building it yourself. What Do You Want in a Custom Grill? Assess exactly what you want before you start the project. Gas or charcoal grill? What amenities do you want, such as cabinets, sinks, refrigerators, running water, electricity, natural gas, and lighting? 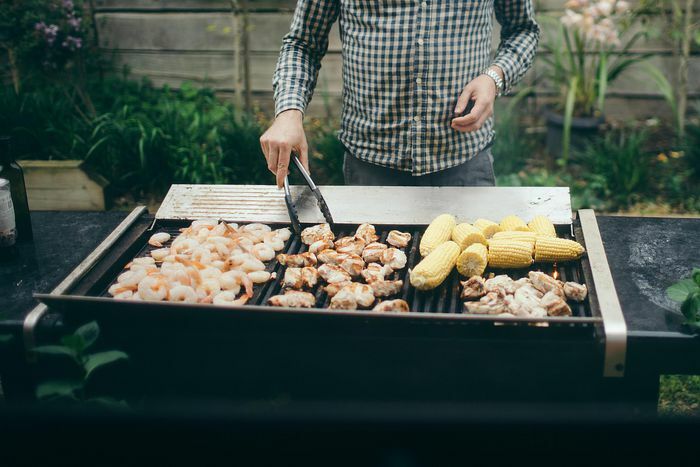 Gas or Charcoal: Gas grills offer you the advantage of controlled heat and features like side burners, rotisseries, and lids that allow you to grill almost anything. While charcoal grills can have these same features it may be a little more difficult to get them since there isn't a lot of selection in pre-made charcoal grills that can be mounted in a custom enclosure. However charcoal does give you a more authentic grilled flavor and there is something more primal and romantic about cooking over coals. This is one decision you should give a lot of thought when you start planning your custom grill. Electrical Outlet: A nearby electrical outlet for your grill can be extremely convenient. Remember that all electrical wiring, conduit, and outlets must be rated for outdoor use. Your hardware store can point you in the right direction for this. Also, consider running an independent ground for your outdoor kitchen. Running water: A small sink and faucet near your grill area will save you many trips indoors. If you live in an area that freezes you need to make sure that you have an indoor shut-off valve and a way to drain the water lines in the fall. You may or may not need to use antifreeze in these lines. Again, your local hardware store will have more information for your area. Lighting: You will want to make sure that your outdoor kitchen has sufficient lighting for those late night cookouts. One good addition is a light near your cooking area because while patio lighting might be good for socializing, it's not always good for preparing food. Storage Space: If you've ever used your kitchen, you know that storage space is a premium. Designing your grill area with at least enough space to store your grilling tools is a must. You will be able to keep tools and accessories close at hand and protected from the elements. You will find that having plenty of storage space will really make your custom grill a great place to cook. Locks: Being able to secure your cabinets is important if you plan on leaving items outside. You can't lock the door to your outdoor kitchen so you might want to be able to lock the cabinets. Some outdoor cabinets can be equipped with locks or you can simply use a good bicycle lock to help secure your investment. Gas grill heads for the top of the line stainless steel grills are only a little less expensive than the full units, meaning $4,000 isn't an unusual price. You can always build in a less expensive grill head, but a standard rule of thumb is that the grill head should be about a half to a third the price of the entire project. Once you've added up lumber, bricks, cement, wiring, sinks, countertops, cabinets and whatever else you want to build into your grill, a $4,000 grill head isn't too extreme. Now you want to look for a location. A grill should be spaced away from existing structures. You might need to check with the local authorities for fire code regulations before you settle on a place. You can build vents and fire-proof barriers around your grill if you need or want it closer to your house or other structure. As a general rule, the placement of your grill should be the same as it is for a freestanding grill. 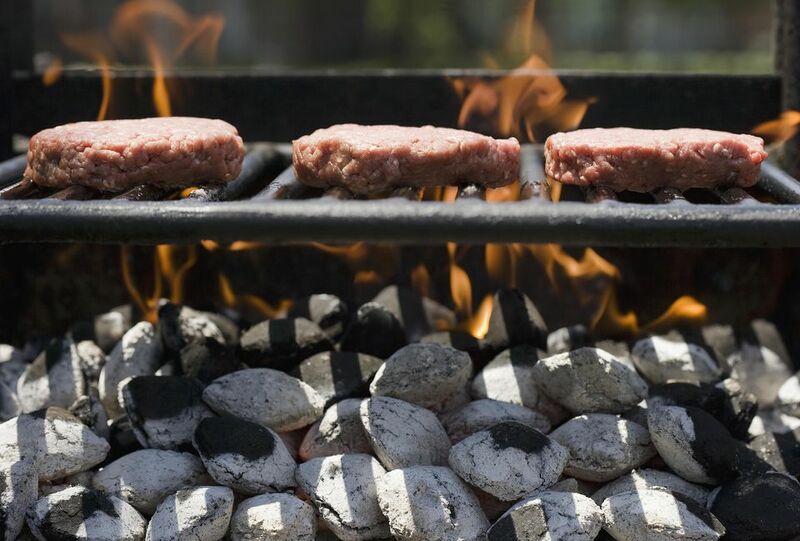 No trees, decks, overhangs or other flammable things should be in the range of your grill. A good way to test out a space for your grill area is to take some empty boxes and build up a basic shape where you'd like your grill to be. This will let you look it over before you dig up any flowers. Once you have a pretty good idea of the direction you want to go in, head off to your favorite hardware store. Many hardware stores have plans and ideas available for free. If they figure you will be buying materials from them they will go out of there way to help you out. One book you can check out is Building Barbecues & Outdoor Kitchens. There are several project ideas and basic construction information in this book. Anyway, a visit to the hardware store can, at least, be a reality check, so you might be back to the planning stages by the time you get home again. If you prefer a gas grill you will need is a sturdy structure of inflammable material with steel supports on which to mount the grill. You want to leave the grill head removable so that it can be replaced or taken for repair if necessary. There should be no exposed wood or other flammable material adjacent to or directly under the grill head. You should also have an accessible space under the grill. Most grills, even the expensive ones can drop grease out the bottom. You will need to have a way to catch this so that it doesn't leak out onto deck surfaces. Gas grills come in propane and natural gas varieties. If you are making a permanently mounted gas grill then you can forgo the changing of propane cylinders in favor of a natural gas grill. This means running a gas line from your house to your grill area. The gas line can be connected from anywhere after the main regulator (meter) to the location of your grill area. If you want to run this line yourself you will need to get your local gas utility to inspect the line before you cover it up. Contact your local gas company about gas line specifications in your area or hire a certified contractor to run the line for you. If you choose to use refillable propane tanks on your gas grill you will need a ventilated place to store the tank. Propane tanks must be stored in a safe place that maintains a temperature below 125 F (50 C). The most basic structure you could build to house a gas grill head will be a block U structure, open on the top and in the front. It will also need to have the necessary mounting supports inside to firmly hold the grill in place. Once you have decided on a grill head you should contact the manufacturer or a distributor to get the exact measurements and specifications for mounting your grill unit. This will give you the starting measurements for your grill structure. Now depending on what kind of other features you plan on adding on you can now measure outwards to get the final shape and size. Once you have the specifications for the grill head you want to install you need to look at the space around the grill. You need plenty of area around the grill to work. But you also need plenty of space to get away from the heat of the grill. Plan on at least one foot of space on either side of your grill head so that you are not fighting the heat to get to the sink. You will probably want space to prepare foods before they hit the grill. Imagine the amount of space you use in your kitchen for these tasks and add that space near the grill as your working space. You want to have a layout that not only works but works for you of your custom grill area. Charcoal grills are great for flavor but do require more attention and preparation. If you prefer a charcoal grill for your outdoor kitchen you will end up doing more customization. There isn't much choice for charcoal grill inserts. You will need to rely on cooking grates that you can buy off the shelf or have someone make them for you. A metal manufacturing company or foundry should be able to provide you with custom grates that fit your specifications. When planning for a custom charcoal grill you need to think about the features you will what to have available. For instance, do you want a lid for roasting foods? Do you want a rotisserie? If you are going to have someone build the metal components for your grill you will need to have the grill unit planned out before you start planning the enclosure. On the most basic level, you will need a pair of metal grates for your charcoal grill. One grate holds the coals and the other holds the food. You also need airflow. When it comes to charcoal cooking, airflow is very important. Air must be able to travel up through the burning coals and out over the food grate. This means sufficient open space to get oxygen into the fire. You also need a space to catch falling ash that is completely fire-proof. You don’t want burning embers falling on your feet or your patio. The charcoal grill area needs to be lined in firebricks. These are the same kind of bricks you would use in a fireplace. Since the firebricks can become very hot they need to sit over top of another layer of brick or block to insulate the area where the fire will live. The construction of the brick lining should also include the mounts or racks for the metal components. Give the metal parts some thought when planning your charcoal grill. You might want a cooking grate that is adjustable to give you that extra level of cooking control. A crank-driven adjustment would allow you to change the level while cooking and give you the ability to sear close to the flame and rise up, away from the fire to finish foods off. If you want to use a rotisserie, there are many units on the market, you need to make sure that you can mount it properly and that it is stable enough to spin any food you might want. When it comes to the metal components you need to choose a metal that will last. Cast iron is great for cooking but will rust if not properly protected and cared for. For this reason, a cover or lid will be very beneficial. When looking into fabricated metal parts, ask about a stainless steel lid to cover the grilling area. One great thing about a charcoal grill is that you can also use it as an outdoor fireplace if you design it to serve this purpose. By creating a front opening to your charcoal grill you can let your fire provide light and heat for outdoor parties and gatherings. One thing to remember however is that you must be able to close this space to protect your griller from the heat. For the remaining parts of your outdoor kitchen, you have a wide variety of options. Most anything you can put in an indoor kitchen can be put in an outdoor kitchen. If you want to go the whole nine yards you can install refrigerators, sinks, hot and cold water, cabinets and even outdoor dishwashers are an option. How far you want to go is entirely up to you. Once you have some basic ideas, talk with the people at your hardware store to find out about availability and cost. Most outdoor appliances cost more than their indoor equivalent. The materials you choose to finish the surfaces of your custom grill enclosure should be durable and match your landscaping and house exterior. This step makes the unit fit your property and amplifies the financial upgrade that a custom grill adds to your house. Since a grill enclosure is built much the way you would an addition to your house, most any material will do. You can even finish off the sides with wood panels to match your house as long as they are not exposed to the heat of your grill. You can get custom-built countertops in a wide variety of materials. Make sure that whatever material you choose that it will be able to withstand the elements; this means extremes of temperature that no kitchen counter will have to put up with. Make sure that if use one of these types of counters, that you tell the suppliers what the purpose is and find out which materials are best suited. The same holds true if you plan on using tile or brick materials for surfaces. Always tell the person you are buying it from what the intended use is and make sure you have something in writing that says the material can handle it.